Swedish furniture has been tremendously popular these last several years, partly due to the the lightness of the painted finishes, and elegance and beauty of carved furniture. Sweden has some of the most beautiful furniture in the world, and furniture has never looked so good since the furniture that was made in Sweden in the 17th and 18th century. One of the biggest draws to Swedish furniture is all the furniture is made from wood. Each piece is individually carved, and often is painted. Popular designs such as fluted leg tables, Louis XVI carved square back chairs, and country benches and demi lune tables, this design is for anyone who loves painted furniture. 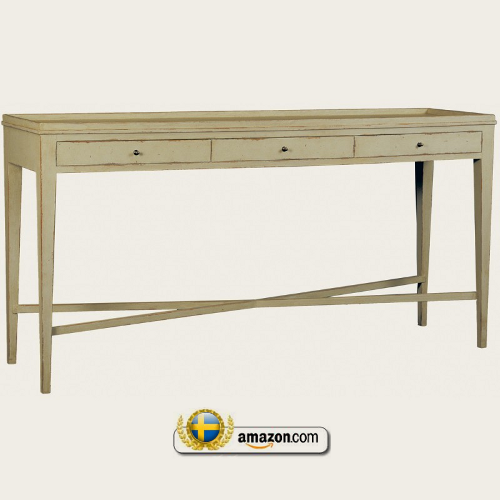 Gustavian furniture is often very costly. It is very common to see a piece of furniture priced into the thousand dollar ranges, even for a wall clock. 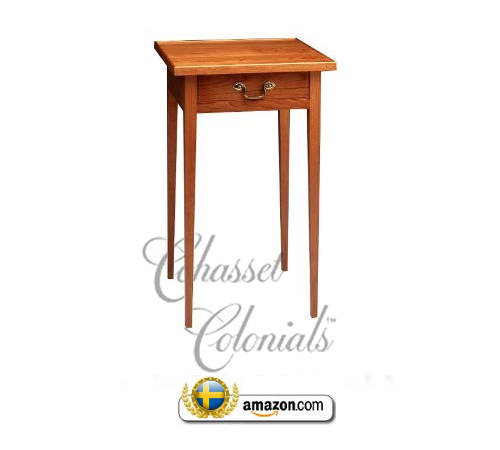 However one design we see in Swedish design is the straight leg table, much like we see in the Early America shaker styles. Straight legged tables, chairs, benches will give you the Swedish look and on a happy note, they are pretty easy to find in America. 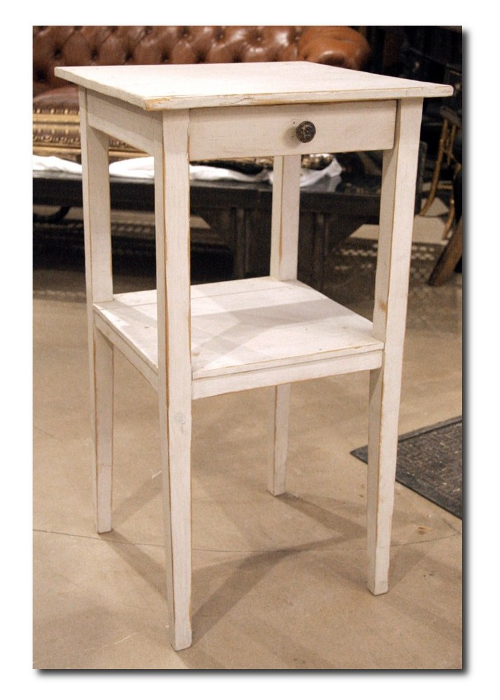 Consider tapered leg tables when hunting for your next white painted piece. The designers had an artist hand-color and glaze 18th-century black-and-white Dutch engravings for the sunroom; eleven are originals, the balance photocopies that are all but indistinguishable from the real thing. Unable to decide which side of Pierre Frey's Mennecy Bleu fabric was more beautiful, Carol Glasser and Katrin Cargill used both, one on the settle and one on the the armchair. Like the table, the pieces are Swedish antiques. 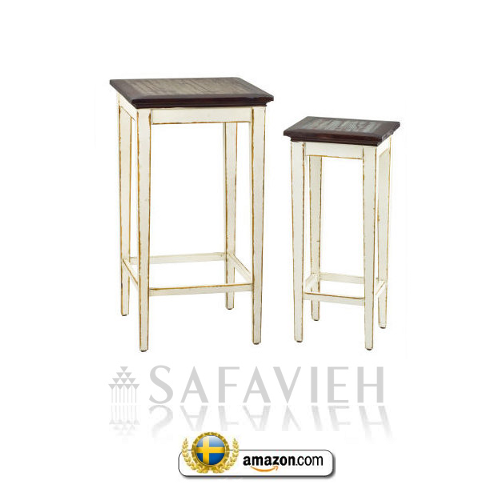 Tapered leg tables have always been a signature Gustavian style. The look is clean and simple. 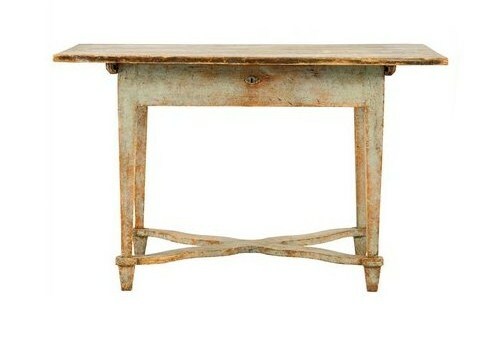 Here we have a light blue heavily natural distressed table. This classic, Swedish inspired Gustavian console is sleek enough for any wall. Place it behind your sofa or along a hallway wall. It's a perfect furniture piece. Shown in 'Gustavian Grey' finish. 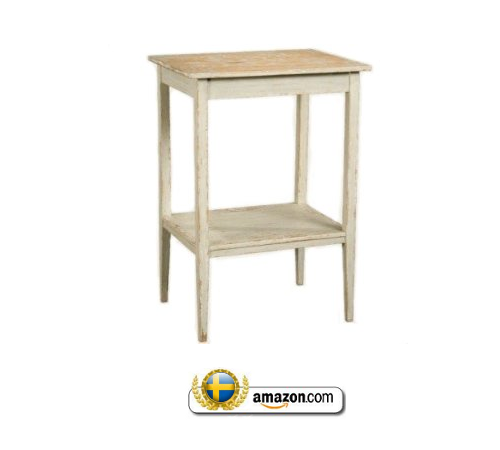 Size: 30" H x 59" W x 16" D.
This classic, Swedish inspired Gustavian side table will fit in just about any room. With a large shelf to store books, magazines, or any other decorative item, it's a perfect furniture piece. Shown in 'Seafoam' finish. This table sells for $787 Size: 29 1/2" H x 20 1/2" W x 16 1/2" D.
Melissa Edelman Antiques had listed a distressed antique Gustavian Swedish night stand that had a shelf and drawer that had beautiful streamlined features. They also had a coordinating Swedish table which featured a cabinet. The table as you can see has a distressed off white painted finish with distressing along the legs. Consider painting the top and adding a table top fitted for the bottom portion of the frame. Buy two sets and pair the larger tables together in one room and the other set of tables in the living room. Use the smaller tables as pedestals for concrete or plaster art.